If you’re looking for a professional face painter for your party or event The Glitterbox has the edge. 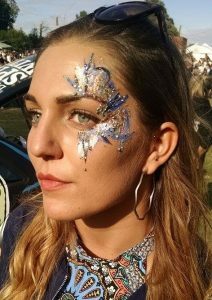 We provide professional creative face paint, body art and glitter makeup for all ages for your parties, weddings, festivals, hen nights, corporate functions, product launches and so much more. 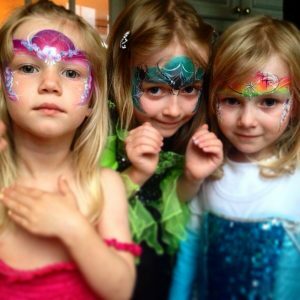 Whether your child would like us to bring rainbows to their Birthday, or your company needs guests to be glitzed and glamourised, we can deliver. We work at tables and we work WALKABOUT, we work solo and we work in teams. Just tell us what you fancy. Each job starts with what YOU need. We work around your venue, your guests, your clients, your children . Just tell us your vision and we’ll take it from there. One thing always remains the same. We pride ourselves on being low-maintenance, low-fuss, with as little effort on your part as possible. If you’re a parent, a bride or an event manager, we know you’ll have enough on your plate, so we let you get on with your plans without distraction. Read more about our PARTIES, WEDDINGS and CORPORATE FUNCTIONS . All face paints used by The Glitterbox are hypo-allergenic and contain anti-bacterial agents, and are safe for both children and adults, except those with skin conditions. Face paints and glitter makeup can be removed simply with warm water and mild soap. The Glitterbox is fully insured for public liability & all Glitterbox artists have a CRB or DBS certificates. Click on the icon below to download a full copy of The Glitterbox Terms & Conditions.